It actually looks like Akeeagoak has taken Resolute as well. Arctic Bay still left to report, though, and it's the biggest community. We've got another result to confirm from Elections Nunavut: Pauloosie Keyootak has retained his seat in Uqqummiut over Jerry Natanine and Jonathan Palluq, who split the Clyde River vote. Wondering if I could get you guys' thoughts on how difficult it seems to be to get votes from your non-home community in these races? It seems like the splits really are from community to community. Congratulations to Pauloosie Keyootak on being re-elected as Member of the Legislative Assembly for Uqqummiut! As someone from out-of-territory looking in, Jerry Natanine was one of the most high profile candidates for me given his battle against seismic testing - but it seems like the vote split in Clyde River did him in. The constituencies that are made up of more than one community are really interesting because people tend to vote for the candidate from their community. But that can split the vote. In Uqqummiut, I think Keyootak was always very popular in his home community of Qikiqtarjuaq, but I'm a a little surprised Jerry Natanine didn't do better. 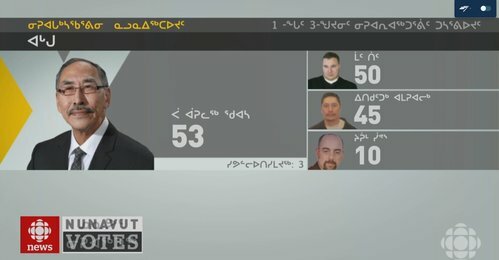 Paul Okalik polling in third in Iqaluit-Sinaa is shocking to me. Thought that would be a close race between Sheutiapik and Okalik. Also starting to see more results in in Rankin Inlet North. Cathy Towtongie is starting to pull away, with Cedric Autut close behind. Incumbent Tom Sammurtok is trailing in third. I'm not surprised Towtongie is polling in first in Rankin Inlet North. She has a lot of support there. 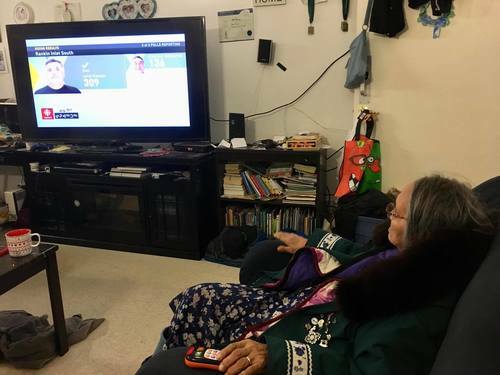 While we wait for more races to be confirmed, had to share this shot from our CBC Nunavut Facebook page from Andrea Tutanuaq in Baker Lake, of her grandmother Winnie Attungala watching our broadcast tonight. Wherever you are in the territory, we're happy you're joining us! First results in in Aggu - it's a very close race with the first poll in. Paul Quassa leads with 53 votes, Matt Teed with 50, and Richard Amarualik with 45. I did NOT expect to see Richard Amarualik polling that well. Not sure if that's good for incumbent Quassa or not. @Garrett I LOVE that photo! Where else are people tuning in from? And what is your snack situation like? @Aggu that is a VERY tight race! I'm seeing people tuning in from all regions of the territory - Iqaluit, of course, Rankin, Igloolik, and beyond. The Northwest Territories, Ontario, Quebec... All over. Let us know where you're joining us from in the comments! Snack situation: one apple and one cup of coffee down, one granola bar sitting here, currently eyeing up the snack table near your side of the newsroom. We even have our former CBC Iqaluit colleague John Van Dusen tuning in from Tokyo! Snacks: one cup of coffee, on a chocolate bar and I've had some chips from our newsroom snack table. I have to be careful to not eat too loudly. I'm behind the results desk. Can we talk about Hudson Bay for a minute? Looks like it's pretty safe to call Netsilik for incumbent Emiliano Qirngnuq. He's put up a big 170 vote lead with only advance polls left from Kugaaruk left to come in. Yes, let's talk Hudson Bay. It's fascinating. The smallest constituency in Nunavut, and very much separated from the rest of the territory. Only the advance polls in so far and they're very close. Qirngnuq has only been in the MLA in Netsilik since a 2016 by-election. First results in for Cambridge Bay as well, where Jeannie Ehaloak has the early lead. It does, Elise - surprised we haven't gotten more complete results yet. You've got to think that we will be seeing the floodgates open soon. One thing I think is important, is that CBC should be making space for written Inuktitut, not just oral Inuktitut (in articles, and on forums like this). Maybe in 2021? I think you're absolutely right, Ruth. There are some issues with fonts, but they've mostly been sorted out at this point. I think making that happen for the next election would be very doable. 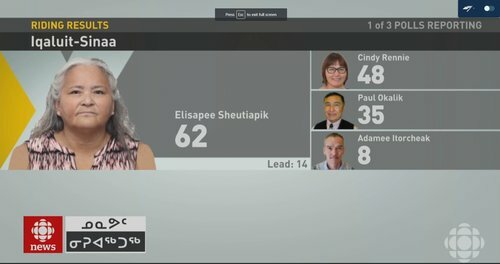 We're now hearing unofficially, but with some certainty, that Pat Angnakak has retained her seat in Iqaluit-Niaqunnguu. Also hearing that Adam Arreak-Lightstone has defeated cabinet minister Monica Ell-Kanayuk in Iqaluit-Manirajak. Again, these are unofficial results, for now. We can officially confirm another result: Allan Rumbolt has held onto his seat in Hudson Bay in a really close 3 way race. And Karen Kabloona has defeated incumbent Simeon Mikkungwak in Baker Lake. Jane, thoughts on those results? The results are starting to come in fast and furious now. Congratulations Karen. She's going to be a powerhouse.